Dixie Contract Carpet recieved the eagle award - the highest honor - at the 2012 ABC Awards Banquet. The architect for the project was Fisher Koppenhafer Architects and the contractor was Stellar Construction. 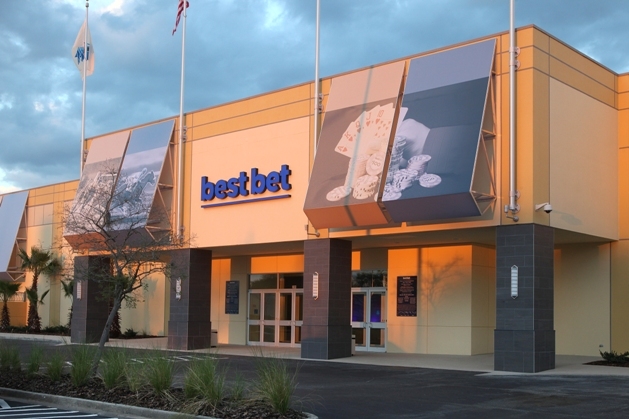 The Best Bet project was a 143,000sf fast track renovation of an existing warehouse building that housed a home decorating retail outlet store to be converted to an adult gaming facility. Dixie Contract Carpet had a significant role in the flooring project from early in the design phase all the way through the completion of the flooring installation. The project had unique requirements that demanded the correct product specifications as well as expert installation to provide a flooring system that performed for the owner’s unique requirements. Dixie Contract Carpet’s involvement in the Best Bet project began early in the design phase when the architect reached out to us for help in finding the most suitable carpet product for this project’s unique conditions. With a gaming facility access to power is required for all gaming tables and machines. These tables and machines will be moved around frequently so flexibility of the power sources is imperitive. The owner required a raised access flooring system to provide the project with maximum power placement flexibility. 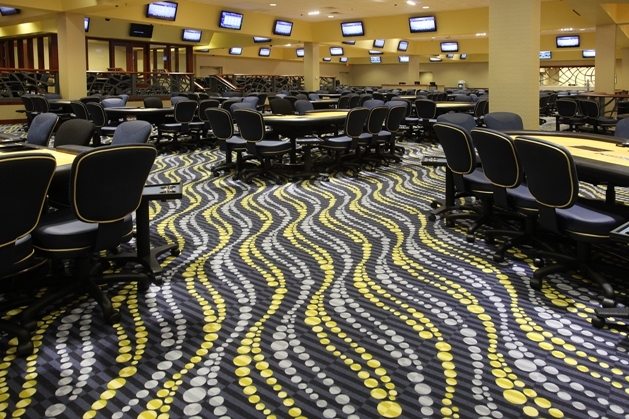 The owner requested the use of carpet for the gaming areas and porcelain tile for the main traffic and eating areas. The porcelain tile areas did not require the same electrical flexibility as the carpet areas. Therefore, a new pour of concrete in these areas was planned to meet up with the raised access floor level areas. Due to a bad past experience with carpet tiles, the owner was strongly against the use of carpet tiles. However, carpet tiles are the only viable option for optimum access to the sub-floor for electrical reconfigurations. The architect engaged Dixie Contract Carpet for research of other instances of broadloom carpet over raised access flooring (RAF). 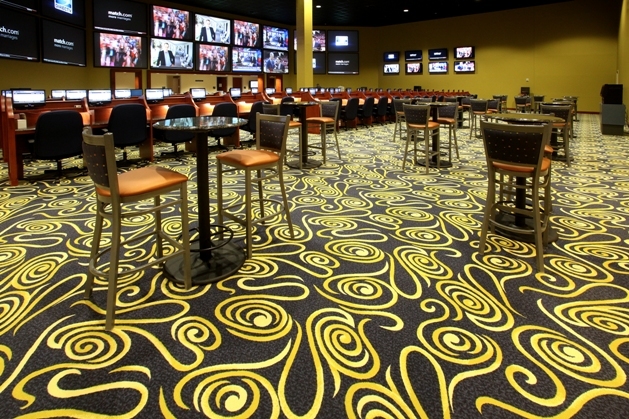 Photos from Casino trade magazines were shared as examples of broadloom carpets used over RAF. Research was done including phone calls to facility managers of the featured casinos in the magazines and it was determined that the carpets were, in fact, carpet tiles and were highly recommended by these casino representatives. A specific manufacturer was identified as the only manufacturer with the technology capable of exact side match patterning to create broadloom looking carpets from carpet tiles. This information was compiled for the architect along with other supporting factors in favor of utilizing carpet tile over broadloom in this project. This research was instrumental in swaying the owner to accept carpet tile for this project. While compiling research on carpet type, Dixie’s staff assisted in custom design services, generating over 80 pattern and color options for the design team to consider, often within a turnaround time of 24 hours. The carpet went from 80 concepts to a final design selections and physical carpet samples within one week. During the bid phase of the project it was determined that the porcelain tile budget needed to be largely reduced. 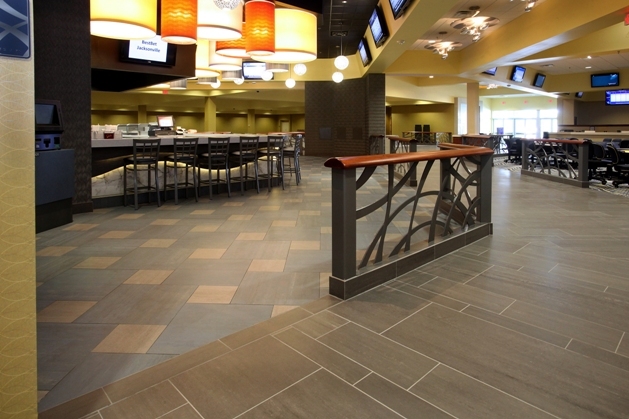 Dixie Contract Carpet assisted the contractor and architect with product samples of alternative tile products along with value assessments of their budget impacts that were a valuable part of aligning the floor finishes with the owner’s budget. During the ordering phase of this project there was a challenge with one of the custom carpet tile samples. The custom carpet sample did not match the computer printed carpet sample utilized in the finish selections. Dixie Contract Carpet worked directly with the manufacturer’s custom department to find the solution to the problem within one week (with over 12 custom samples produced to finally get one that worked). While installing the porcelain tile, a major coordination issue was discovered where the intended design was not achievable with the specified porcelain tile. Dixie’s project Supervisor created alternate patterns and installed mock ups of those options for the design team’s approval, one of which was accepted by the architect and prevented delay of the project schedule. The dedication and collaboration of design team, contractor and sub-contractor paid off in the end with a casino style gaming facility unique to Jacksonville that has already proven itself popular with the public. Flooring transitions are seamless, despite the challenge the whole team faced in integrating raised access sub-floors with newly poured sub-floors and ADA compliant ramps. The owner has supreme flexibility due to the use of carpet tiles and the custom designed carpets imitate the seamlessness of traditional broadloom carpet. The Best Bet project is special because of the specialized products that were integral to the success of this unique end use category. The ability of Dixie Contract Carpet to support the design team with their expertise in flooring and steer specific products with unique performance and aesthetic capabilities mandatory for the functional and aesthetic success of the project is also special and unique to flooring contractors. The project qualifies for the ABC Excellence award because of the consistent dedication that Dixie Contract Carpet provided both the design team and the contractor to ensure the project’s success from pre-design support to working through ordering and on site challenges and ending with a notable and functional final product. News articles quote persons with positive comments about the project’s aesthetic success.